Diatomaceous earth (DE) is an inexpensive natural compound with multiple uses. As a food grade powder it can be used to detox heavy metals, parasites, and microbial pathogens. It also distributes silica internally. Silica is an important component of bone matter. So is magnesium, which is to a lesser extent part of DE. Without silica and magnesium, supplementing calcium alone is dangerous. Calcium’s assimilation into building bone matter depends on both silica and magnesium as well as vitamin D. Without proper assimilation into bone matter, calcium remains in the blood and can literally calcify in the arteries, creating arteriosclerosis. DE is known for its ability to safely eliminate bugs of all types, including bedbugs, from dwellings, gardens, and small organic farms. It’s safe because it is non-toxic to humans and animals. Chemical insecticides are toxic to mammalian nervous systems. That’s how they work on insects, by destroying their nervous systems. Diatomaceous earth works on insects externally by desiccating (completely drying) their exoskeletons or hard outer surfaces, which they need to survive. So yes, this inexpensive abundant material can be used in various ways safely as long as it is food grade DE. 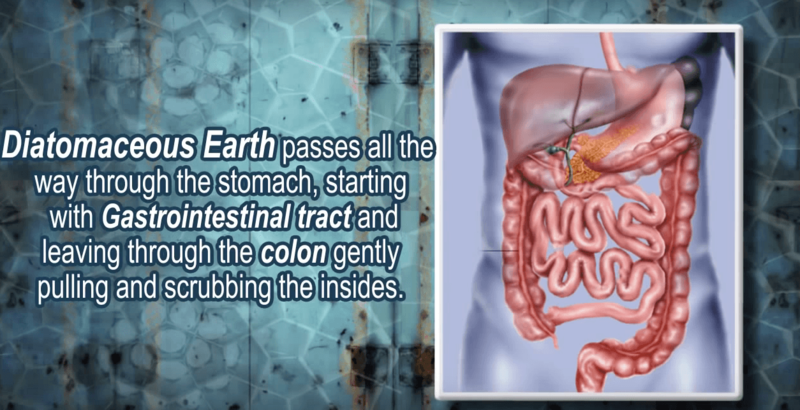 Two types of diatomaceous earth. This article is talking about the stuff straight out of the ground. The other type is heated to a couple thousand degrees to cause it to crystallize for use for filtering wine, swimming pools and so on. It is lethal, if consumed, because there is nothing gentle about it, due to the crystallization.